In the fourth and last event of The City as a Project doctoral defence, Fernando Donis will defend his thesis work in front of Michiel Riedijk, S. Umberto Barbieri (TU Delft, Promotors), Pier Vittorio Aureli (AA, co-promotor), Alejandro Hernández Gálvez (Universidad Iberoamericana), Fernanda Canales (Universidad Iberoamericana), Kees Kaan (TU Delft), Gabriele Mastrigli (Università di Camerino). This specific form, the frame, finds in the historical development of Mexico City one of its most explicit paradigms. The only way we can understand and design this contradictory city is when framing it within a recognizable form, which in this thesis is manifested in different scales and forms of representation, from the physical to the representational. Distant depictions or “stages” within this project reiterate on the architecture of the frame: the ritual plazas, the codex, the mural, the city itself and the tectonic frame as its most architectural solidification, are conscious partitions from Mexico city’s urban history as they all encapsulate and underline a different version of the same project; ironically existing in the paradigmatic city whose urbanization cannot be contained any longer. The public frame is the prospect of having an architecture where “becoming,” the unfolding of life, is forged, framed. The cultural development of Mexico is based on movement forward. Mesoamerican thought and architecture were “designed” as a series of steps to surpass, endlessly, as time was considered cyclical. 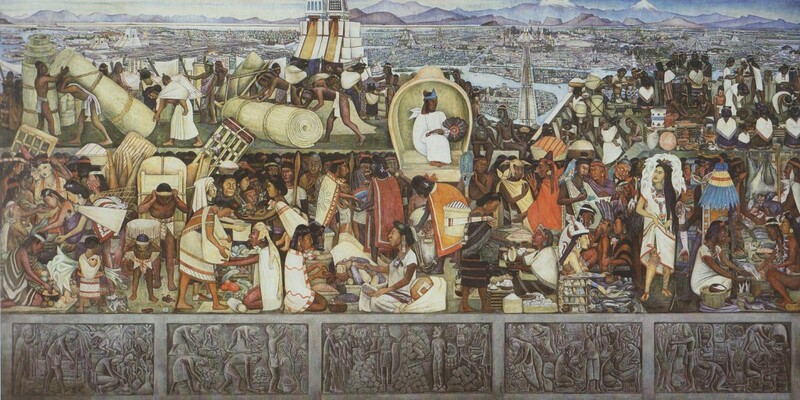 “Moving” in Mesoamerican culture meant to cross “frames,” life stages materialized in the construction of their cities in diverse forms: from large ceremonial avenues literally designed in processional steps to fulfill the cosmic myths, to the architecture of the symbolic pyramids and the courtyard living quarters. From Teotihuacan (classic) to Tenochtitlan (post classic, Renaissance time in the West), the cultural movement forward produced urban and economically sophisticated centers; the latter being built in less than two hundred years. Such progress was dramatically interrupted by the Spanish conquest, which would initiate a series of historical invasions and looting of the country, cities and resources, a never ending colonization in different forms combined with internal revolts. This has become a condition that pervades Mexican culture, what we call the Culture of Contradiction: an irretrievable tension between the local and colonizer forces, between Mesoamerica and the West, the Spanish; the Mexican and American, French; contradiction manifested in the urban environment. From initial movement forward, to organizer of such contradiction, the frame and framework have become both compliant and resistant of its inevitability. They celebrate and criticize the city in its complex making, granting the last possible intelligibility of its history and integration of its people.